London, Sampson Low, Marston & CO.
FRIST EDITION. 8vo, pp. 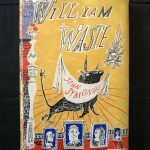 123, with illustrated frontispiece and 14 b&w illustrations, one at the beginning of each chapter, plus illustrated dust jacket, somewhat worn and damaged, but repaired and laid on a layer of new paper. All illustrations by André François. Red buckram with white lettering to spine. 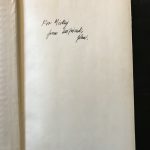 Author’s presentation copy, inscribed on front free endpaper and dedicated to the scholar and poet Michael Hamburger: “For Mickey / from his friend / John”. A good copy.